Prime Minister Sheikh Hasina on Tuesday (Feb 5) expressed her government’s firm resolve to make Bangladesh Police a people-friendly organization saying the government would continue to enhance its strength in accordance with prevailing demand. 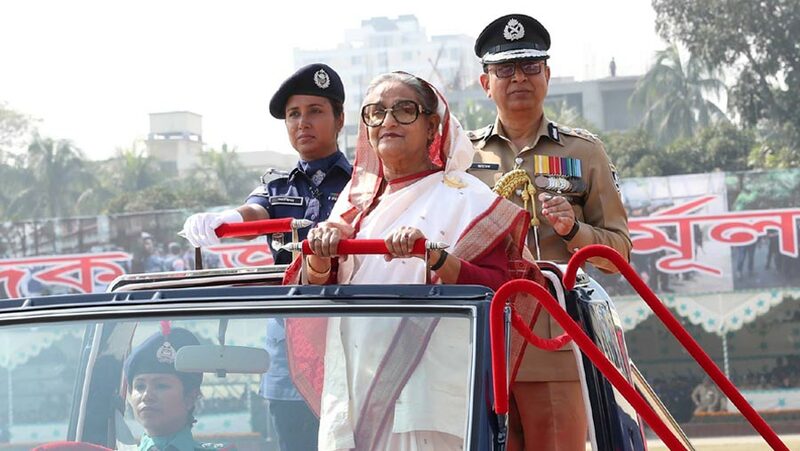 “Required measures will be taken to increase necessary and modern vehicles, logistics, arms, land allocation, and improve infrastructural development for the police force,” the PM said while inaugurating Police Week-2019 at Dhaka Metropolitan Police Lines at Rajarbag in Dhaka. “We will continue this improvement of Bangladesh Police during our present tenure,” the PM added. Home Minister Asaduzzaman Khan Kamal, Inspector General of Police (IGP) Jabed Patwari, and senior government officials were present. Cabinet members, MPs, senior government officials, leaders of various professional bodies and civil society members joined the function. The premier adorned 349 police personnel with Bangladesh Police Medal (BPM), and President Police Medal (PPM) in recognition to their professional excellence. Out of them, 104 received BPM (service) and 40 received BPM (bravery) medal while 143 received PPM (service) and 62 received PPM (bravery) medal. On the occasion, an attractive parade was arranged at Rajarbag Police Lines. The PM inspected the parade and took salute of different contingents of Bangladesh Police, local media report said.